I had some scraps of fabric left over after making denim bags and decided to use them up on a project that I've had in mind for some time. There weren't many scraps so I also pulled out my box of old jeans, which I've been collecting for at least 10 years. I have used some of them in the past for cushions and even a journal cover. 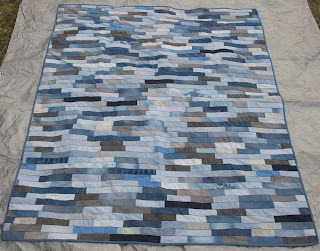 But now I was ready to attempt something a bit bigger - a queen-size bed quilt. Now, I could have cut the fabric into squares but I thought it would look good in 2.5 inch strips (I'm really good at making things difficult for myself). So I cut lots and lots and lots of strips and joined them together into a strip that was about 140 metres (over 150 yards) long. It rolled up into a very large "jelly roll". 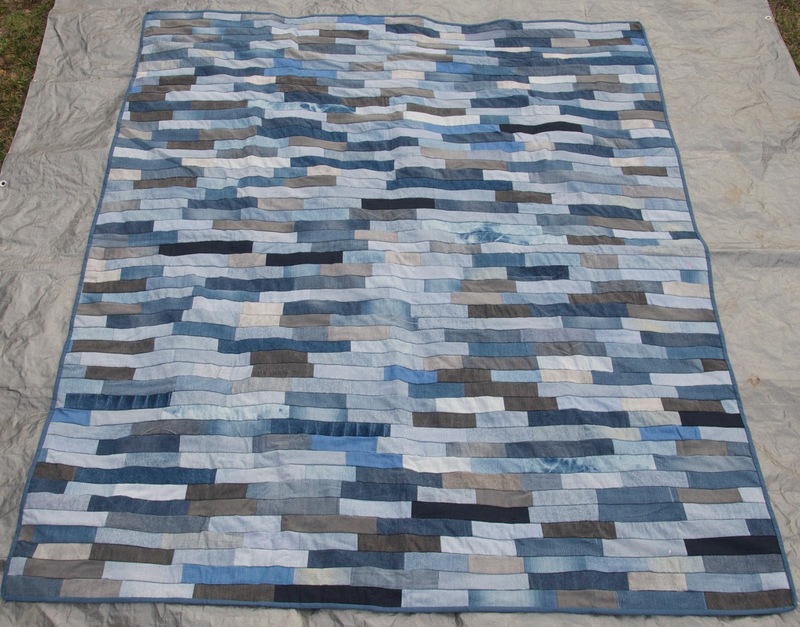 I then cut it into 50 strips, each a bit over 2 metres long, sewed them together, and quilted it with ditch stitching (it felt like wrestling a boa constrictor).